his minions for being captivated by the bandito's girlfriend. “Hangin’ ‘Round” Written by Michael Murphy; Produced by Douglas Farthing Hatlelid. Yes, it is...but you certainly wouldn’t want to be kidnapped there! The Monkees’ second season opener finds The Monkeemobile breaking down in a backwater Mexican town, El Monotono. While Lupé, a mechanic, looks her over, the guys enter The El Monotono Cantina, where, while ordering, David becomes smitten with Angelita, the pretty waitress, but her father, Pedro, the Cantina's proprietor, insists he mustn't see Angelita and that they must leave town at once. José, a bandito, reports Angelita is the woman of El Diablo, a/k/a The Bandit Without A Heart. José throws a knife at The Monkees table, sending them stacking up their chairs on tables and scurrying out into the street. David tries to go back in the cafe to see Angelita, but José intimidates them once more with the knife. Checking on the progress of their car, Lupé tells them that the whole engine needs to be replaced, costing $14.95. To earn the money, The Monkees persuade Pedro to hire them for the café and are a huge success, with their new tune “What Am I Doing Hangin’ ‘Round?”. After Pedro pays them, they all plan to skip town right away until David spots Angelita again and insists against his mates’ wishes on saying goodbye. He bids her farewell though Angelita explains that she doesn’t want to be El Diablo’s woman but no one has much choice in El Monotono. Soon she and David are locked in a kiss just as a man storms in announcing that El Diablo and his bandits are on their way, causing the patrons to run away in fear. Sure enough, El Diablo and his horde of banditos barge into the café causing a raucous with their shooting and witnesses David and Angelita still engaged in their goodbye kiss. He begins humiliating David by shooting at his feet to make him dance then forces him at gunpoint to beg for his life on his hands and knees. The other Monkees briefly join in until El Diablo frightens them back with his gun. As he degrades him to Angelita, she still declares her love for him anyway and starts displaying affection for him further rousing the bandit’s ire. El Diablo then has his minions drag David to their camp while the other Monkees watch helplessly. The other guys attempt to intervene but their fear of El Diablo quickly discourages them. Micky tries to get help from the townsfolk by making a moving speech about standing up for themselves but it backfires when he insists they go to El Diablo’s camp and confront the bandits, and they flee. Then Micky, Michael and Peter decide to disguise themselves as Mexican bandits all drabbed with fake moustaches and, after paying Lupé for the repairs to The Monkeemobile, set out to rescue David. As David stands tied to a tree guarded by one of El Diablo's underlings, the trio barge into the bandito camp firing their guns into the air, but the bandits aren’t stirred up by their pretense. Only when the guys lower their guns, the bandits surround them at gunpoint; José has The Monkees taken to El Diablo in his tent. There, they present themselves as El Dolenzio (a/k/a The Bandit Without A Soul), El Nesmito (a/k/a The Bandit Without Any Conscience), and El Torko (a/k/a The Bandit Without A Nickname), and suggest joining forces. Not impressed, El Diablo proposes a series of tests, but warns of the consequences should they fail. First there’s a test of strength in which El Diablo and Michael arm wrestle and Michael wins by inadvertently knocking the former senseless with a board. Second, a test of skill and determination involves El Diablo and Peter playing cards (Go Fish) and smoking cigars, and Peter defeats him. Finally, a test of bravery has the bandit and Micky engaging in combat by grabbing the end of a small rope while trying to knife each other, and Micky wins by slashing the rope and sending the bandits tumbling to the ground. Later, Micky, Michael and Peter, having successfully met every challenge by using their wits, celebrate with the bandits by drinking booze, but the guys actually spill their drinks on the ground. While the bandits get drunk, Michael sends Peter off to find David. When El Diablo questions Peter's departure, Michael and Micky allay his suspicions by saying he needs some fresh air after consuming a great amount of wine. A short distance away, Peter arrives to rescue David, trying unsuccessfully to get the guard to leave for the party who doesn’t understand English until Peter says the word “booze!.” At first, David is fearful not recognizing Peter, then he tries to get him to untie him but Peter can’t undo the rope binding his wrists, as it is tied in a square knot. Meanwhile back at the party, Micky gets caught up in the celebration as he dances on the table to keep the bandits amused ("I'm just trying to mingle!") and Michael has to persuade him to leave with him to find the others; using the same excuse for Peter’s departure, they head off. When they do arrive to where David and Peter are, Peter is still trying to untie David and Micky effortlessly undoes David's bind ("You just put the loose end through the figure 8!"). Then they jump into The Monkeemobile planning to drive off but are stopped quickly by a Mexican parking attendant who charges them $0.50 for parking and having done so, the guys respond by running over his toe driving off. When El Diablo sees that David and the others are gone, he realizes they’ve been duped and sends his chief bandito José after them. It isn't long before The Monkeemobile runs out of gas, forcing The Monkees to push her back to El Monotono. Lupé the mechanic offers to provide them with gas, and David rejoins Angelita. Just then, El Diablo's bandit rides into town to deliver an ultimatum to Micky, “the musician who claimed to be El Dolenzio”. Micky reads the message that states that El Diablo has challenged him to a duel of honor at the center of town at high noon. At first Micky and the others prepare to flee until Angelita insists that El Diablo will take his anger out on the townsfolk should Micky not show up for the showdown. Later, in The Cantina, Micky, now dressed in a white cowboy outfit, prepares for his showdown with El Diablo as David, Peter and Michael help him with his gear. When the clock strikes high noon, Micky in wild west-style confronts El Diablo; after advancing towards each other, El Diablo orders him to draw on the count of 3 but El Diablo cheats by drawing on the count of 2 instead and firing on Micky repeatedly. However, Micky taunts him on missing him making silly faces and then, as they sing “What Am I Doing Hangin’ ‘Round?,” The Monkees and the bandits engage in battle which ends with them roping the banditos and winning, while David kisses Angelita. “It’s A Nice Place To Visit...” (a.k.a. "The Monkees In Mexico") was originally the ninth episode produced for The Monkees' second season, but was chosen by NBC to open it. This second season premiere took place almost a full year after the NBC telecast of the premiere episode, “The Royal Flush”. Filming on the TV series resumed on the same day as this telecast. Throughout this season, the number of songs in each Monkees episode (save for No. 54, "The Monkees In Paris" [a.k.a. "The Paris Show"]) would be limited to 1 to 2 tunes per week. The harpsichord rendition of the Monkees theme, which graced the submain titles (writer[s] and director) of the show throughout its entire first season, would slowly be phased out in the early stages of its second season, in favor of new submain title ditties which were instituted to fit in with the feeling of the episodes. Incidentally, part of the submain title theme for “It’s A Nice Place To Visit...” was reused as the submain title theme for Episode No. 45, "The Monkees In Texas" and it briefly can be heard again in Episode No. 53, "The Monkees Race Again" (a.k.a. "Leave The Driving To Us"). The Michael Martin Murphey-Owen Castleman tune “What Am I Doing Hangin’ ‘Round?” has been inadvertently listed as “Hangin’ ‘Round” in the end credits of every episode of The Monkees in its second season which featured it: this and Episode No. 40, "Monkees Marooned", and No. 53, "The Monkees Race Again" (a.k.a. "Leave The Driving To Us"). The tag sequence “It’s A Nice Place To Visit…” appears neither in syndicated repeats, the October 1995 release of the Rhino Monkees Deluxe Limited Edition Box Set (R3 2960), nor the November 2003 release of Rhino's Monkees Season 2 DVD Boxed Set (R2 970128). Not since its original airing has “It’s A Nice Place To Visit…” rerun with its tag sequence intact! According to its entry in the Screen Gems Storylines, “Visit…” originally ended with David tearing away from kissing Angelita long enough to knock out El Diablo. This episode's original synopsis also indicated the chase climax involved "a furious battle with water pistols, bazookas and darts." Also, The El Monotono Cantina was called "Pedro's Café." “It’s A Nice Place To Visit...” (a.k.a. "The Monkees In Mexico") was one of only two Monkees episodes to be repeated on The Peacock Network while the first run episodes were still being aired before the summer repeat season, aside from the March 18, 1968 repeat of No. 39, "Hillbilly Honeymoon" (a.k.a. "Double Barrell Shotgun Wedding") (sponsored that week by Twiggy Lashes/Eye Paint and Londonderry Hair by Yardley Of London™). “It’s A Nice Place To Visit…” was seen only once during the Saturday Afternoon run of The Monkees: at noon (EDT) on November 22, 1969 on CBS. "For Pete's Sake," the Peter Tork/Joseph Richards tune from The Monkees' 3rd LP The Monkees’ Headquarters newly recruited as a replacement for the "(Theme From) The Monkees" as the show's second season end title theme, appears during the end credits of "Visit..." and Episode No. 52, "The Devil And Peter Tork", in a slightly different edit than the other second season segments. The tune first appeared on the series in a redubbed June 26, 1967 repeat of Episode No. 12, “I've Got A Little Song Here”. Current syndicated versions of the dinner scene has some footage removed, apparently to eliminate a glitch on the original film interpositive—a glitch which has been included on the Rhino VHS/DVD home video releases and the Columbia House Collector's Edition. The following scenes from “It’s A Nice Place To Visit...” are edited into The Monkees' second season opening: David as a cowboy pulling a fast draw and his gun holster belt falls down; and Micky and Michael dressed as cowboys, their hats flying up into the air. Incidentally, the start of the showdown climax features a brief clip of David rising up and hitting his head on a test-your-strength device's bell (from Episode No. 10, “Here Come The Monkees”) which is the first thing you see in The Monkees' first season opening! Also notice in the second-season opening titles that David, Micky and Michael (from clips of them seen in Episode No. 35, "Everywhere A Sheik Sheik", No. 52, "The Devil And Peter Tork", and No. 30, “The Monkees In Manhattan” [a.k.a “The Monkees Manhattan Style”], respectively) are all miscredited as "Peter," representing The Monkees TV show's off-the-wall zaniness that would transpire in this season. In the dinner scene where they are celebrating, at the first toast, Micky, Michael and Peter throw the "booze" out behind them. But at the second toast, without refilling their cups, they smash the cups together, and liquid comes out! When the band perform “What Am I Doing Hangin’ ‘Round?” at the cafe, note that The Monkees are sporting their late-67 hairstyles, but when the come off the stage they're sporting their mid-67 hairstyles. This is of course because the performance of “What Am I Doing Hangin’ ‘Round?” was recorded after the episode had been filmed. Michael Nesmith says they could always sing the second verse again, but the song has three verses, not two, and each are part of the same story, so it wouldn't make sense to sing the second verse again! Although the climactic showdown between El Diablo and Micky was to take place at the center of town at high noon, the church bell peals only 11 times! The Monkeemobile makes her debut appearance in this episode with The Monkees' guitar logo as door decals. During the “What Am I Doing Hangin’ ‘Round?” romp sequence, look for David Jones briefly carrying around a copy of The Beatles’ then-newest album Sgt. Pepper’s Lonely Hearts Club Band, which was released on June 1, 1967—interestingly the very eve of the day “It’s A Nice Place To Visit...” (a.k.a. "The Monkees In Mexico") wrapped production. Ironically, Sgt. Pepper would go on to end The Monkees’ Headquarters' reign at the #1 spot after just one week!!!! Also notice that Michael Nesmith now has a new voice, due greatly to a tonsillectomy he had on May 23, 1967. This is the first filmed Monkees episode to feature Nesmith and his new voice. Also, a new feature is added to Nesmith's wool hat: 6 buttons (based loosely on The Monkees' 8-buttoned shirts!)! This would be the very last of the 4 wool hats Michael Nesmith adorned on The Monkees TV series; Gene Ashman provided 3 of these hats which patterned after Nes' original dark green wool hat. When Michael (El Nesmito) wonders whether they should carry a club card or some badges, Micky (El Dolenzio) sneers, "Badges?! We don't need no steenking badges!," taking a cue from the character Gold Hat, which was portrayed by Mexican character actor Alfonso Bedoya in The Treasure of the Sierra Madre (Warner Bros., 1948). Check out the snazzy sheepskin vest worn by El Diablo. This vest was first seen in Episode No. 5, “The Spy Who Came In From The Cool”, in which enemy agent Boris (the late Jacques Aubuchon) wears it as part of his disguise as protest singer The Bear, and in No. 16, “The Son Of A Gypsy”, it was worn by gypsy Marco (Vincent Beck). It will be reused twice, in Episode No. 52, "The Devil And Peter Tork," in which it is worn by Atilla The Hun (Lee Kolima), and in The Monkees 1968 feature film HEAD in which it is donned by Lord Hign 'n' Low (the late Timothy Carey). 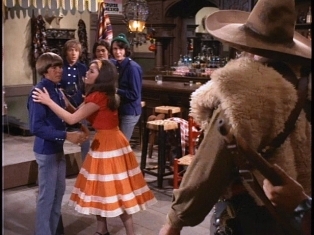 Monkee stand-in/roady David Pearl can be seen amongst the townsfolk in Pedro’s Café in the scene where Micky tries in vain to gain their assistance. The exterior knifefight scene was shot on the set which would later be used as The Weskitts' farmyard in Episode No. 39, "Hillbilly Honeymoon" (a.k.a. "Double Barrell Shotgun Wedding"). It will be reused as the exterior of Aunt Kate's ranch in Episode No. 45, "The Monkees In Texas". This episode features a gag used occasionally in The Monkees. The villains go into a huddle and when they all look up, everyone except the leader, has been replaced by The Monkees. It's used again in Episode No. 35, "Everywhere A Sheik Sheik". The “What Am I Doing Hangin’ ‘Round?” romp features a gag in which The Monkees start fighting on the side of the villains during the romp, as well as fighting against them. This would be used again in Episode No. 45, "The Monkees In Texas". Another gag in this romp reused in "The Monkees In Texas" is that featuring David jumping on a horse...facing the wrong way. For the third time on the show a Monkee is featured as "the good guy in white": Micky. Michael and David can be seen portraying similar roles in fantasy sequences seen in Episode No. 7, “The Monkees In A Ghost Town”, and No. 31, “The Monkees At The Movies”, respectively. Two years after the telecast of this episode depicting The Monkees in Mexico, the group (sans Peter Tork) actually went south of the border in real life, playing a 5-night gig with Sam & The Goodtimers at The Forum in Mexico City, Mexico from July 24-9, 1969. The late Peter Whitney (El Diablo) participated in many film & TV activities, including Sgt. Buck Sinclair on The Rough Riders (ABC, 1958-59), Lafayette 'Lafe' Crick on The Beverly Hillbillies (CBS, 1962-71), and George Courtney in the Oscar-winning In The Heat Of The Night (United Artists, 1967). Amidst a great body of episodic TV guest work, Nate Esformes (José) appeared in the February 15, 1968 episode of Daniel Boone (NBC, 1964-70), "The Spanish Fort" (#1414), with Theo Marcuse (“The Royal Flush”). Not long after, he guest-starred with “It’s A Nice Place To Visit...” co-guest Nacho Galindo in the April 8, 1968 episode of I Spy (NBC, 1965-68), "Carmelita Is One of Us," the next-to-last installment of the series. Cynthia Hull (Angelita) later played Ann in Here Come The Brides (ABC, 1968-70), which starred Monkee guest alumnus Bobby Sherman (“The Monkees At The Movies”). The late Pedro Gonzales-Gonzales (Lupé) first came to notice as a contestant on Groucho Marx's quiz show, You Bet Your Life (a.k.a. The Groucho Show, NBC, 1950-61) His highly amusing personality won him bit parts in films, and he continued to work as a minor supporting player for years until his passing in February 2006. Interestingly, Gonzales-Gonzales shared a birthday with co-“It’s A Nice Place To Visit...” guest Peter Whitney: May 24.